More than 200 quilts made by Raintree Quilters Guild members, or belonging to one of two special collections we're exhibiting. Judging is complete and the ribbons will be attached to all the winning quilts. Come back to the website the evening of Thursday, 9/21 to see the Big Winners listed with their photos. A Boutique of hand-crafted gift items and accessories you'll love for fall and for Christmas. You'll see collections of hand-made pincushions, hand-crafted Christmas ornaments and unique and colorful useful baby and other fashion and home accessories. 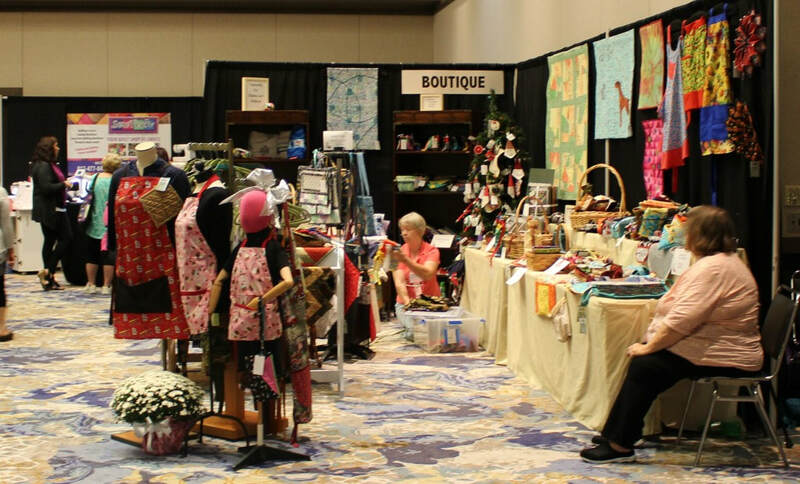 Profits from the Boutique support the Quilt Show expenses. A Merchant Mall of Vendors who will be selling sewing machines, cutting, piecing and quilting solutions, supplies and tools, and quilted and crafted art and gifts as well as vintage quilt tops and materials. Raffle Baskets - The Raffle Basket committee reports that they collected so many terrific items for the Raffle Baskets that many are SUPER-STUFFED with great items. These baskets and other FAB items will be raffled using the Scatter raffle method: You buy 25 tickets for $5 and distribute individual tickets to the drawings for the different raffle baskets or items you want to win. 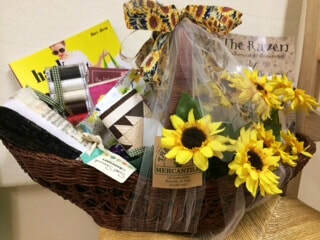 There are Raffle Baskets, like the one with sunflowers below from Village Mercantile of Boonville, and Fab Items including BRAND NEW Sewing Machines from Bernina of Evansville and Let's Sew(also in Evansville), a stained glass hanging, Vera Bradley bags and a gorgeous hand-woven basket. 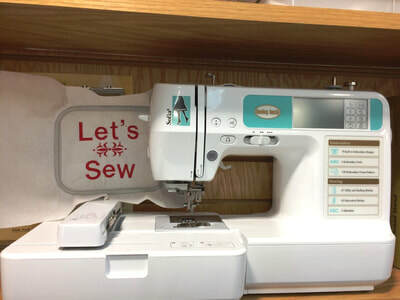 Several of the Raffle Gift Baskets are quilters dream samplers (fabric, tools, etc.). 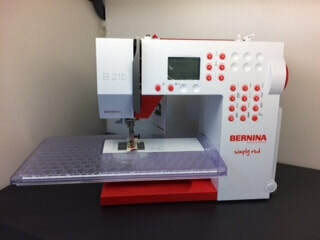 Others pamper quilters (or anyone). It's expensive putting on a Quilt Show like this. Proceeds from Raffle Baskets help cover Quilt Show expenses. 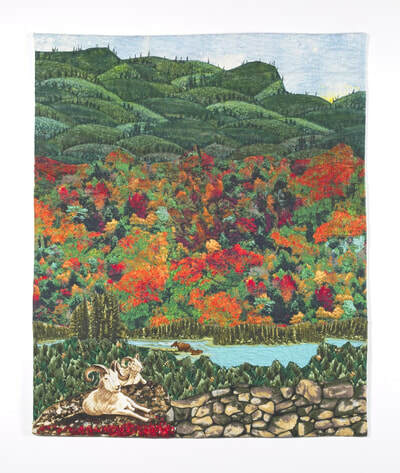 A Silent/Online Auction of hand-crafted and quilted items. You can also bid in advance online for these items by going to the bidding website from now until 9/18/2017. (Use the black button below.) Then bidding continues at the Quilt Show. Use the green button below for more on the the auction. Live auction of quilts made by Raintree quilters to benefit Susan G. Komen Evansville Affiliate. This auction will be held at the Quilt Show site on Saturday, 9/23 at 2:00 pm. 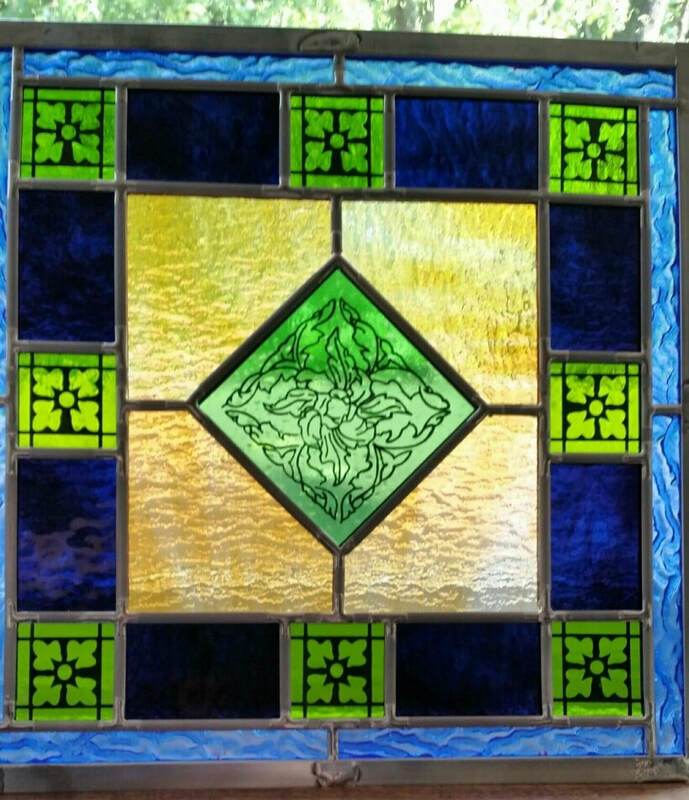 FYI: Raintree Quilters Guild conducted a Quilt for the Cure Quilt Block Contest in 2016. 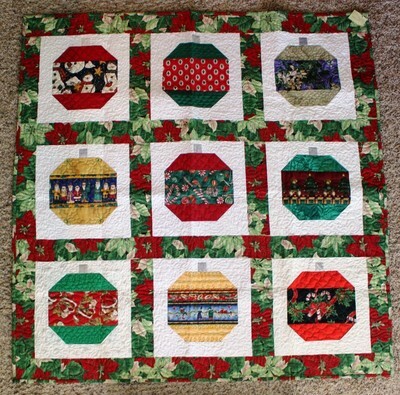 Several quilts were constructed from the blocks made for this contest. Other blocks were made into tote bags or attractive framed works. Some have Susan G. Komen themes and others are just pretty quilts. To see photos of all these items use the button below. A Block Search game has been added. Each visitor will get a Block Search sheet with a list of blocks. Each Vendor will have a different block posted. The visitor writes down the Vendor name next to the correct block on their sheet. Correctly completed sheets will be placed in the drawing. A nice gift basket will be awarded to the winner of the drawing each day. Diamond Galleria $500 Gift Certificate raffle tickets available at the Komen table. 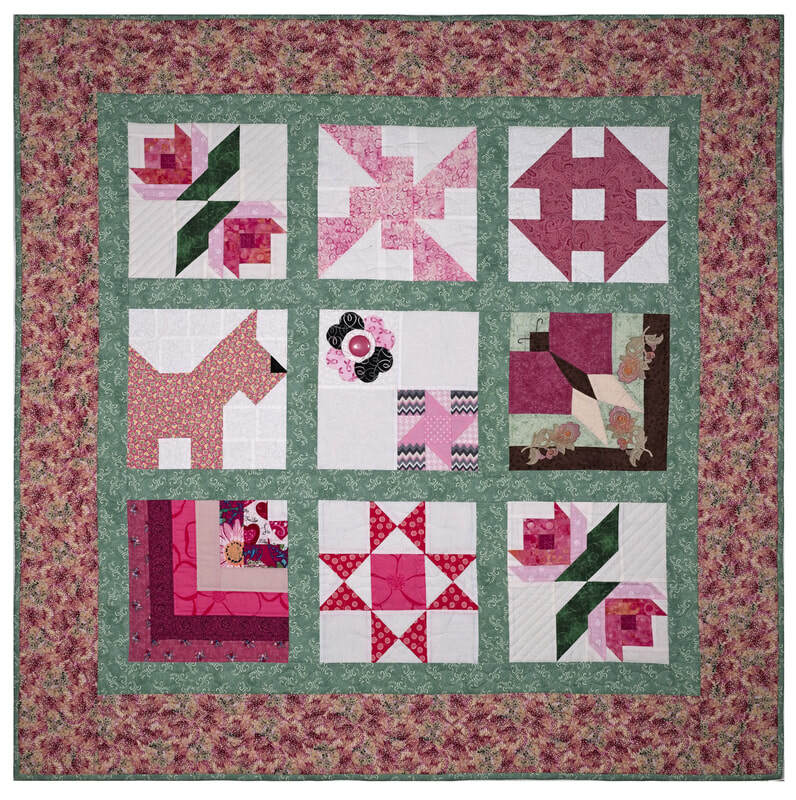 OR You can WIN a raffle ticket just by wearing PINK at the Quilt Show on Saturday, 9/23! The Diamond Galleria raffle tickets benefit Susan G. Komen, Evansville Affiliate. A Hands-on Quilting Demonstration where you can rest your feet and learn how to hand quilt or just watch and enjoy the company.